Joyful Mayhem: April Fool's Day 2015!!!!! Light showers or sunny skies, who knows what Mother Nature may bring. Regardless, I know what I will bring and that's lots and lots of pranks to my family. I have loved pranks since I was young. I remember going up to my mom, with my mouth full of air, and having her squeeze my checks. Sometimes I would put a small drop of water in the corner of my mouth to try and trick her into thinking it was full of water. No dice. She would still squeeze the air. One day, I filled my mouth full of water, wiped it dry and went to my mom as usual. She squeezed! The joy! The exhilaration! It was a feeling I loved, and thankfully, she responded positively. Later, I would join friends prank calling after school. We would randomly pick people out of the phone book and ask the old standby, "is your refrigerator running?" among other silly things. We thought we sounded so official and mature, but obviously we were deluded by the mischievous fun we were having. It didn't matter. It also didn't matter what they did when they answered. While some people played along, and others got mad, we would hang up unable to stifle our laughter. I'm (only) a little embarrassed to say the prank calls continued into high school. I laughed even harder then. I categorize an acceptable prank as anything I could do to someone, that I wouldn't mind if it were done to me. I'm not down for anything mean that causes damage, physical pain or a mess that costs more than a broom or 10 minutes will get you. I started celebrating April Fool's Day with my family in 2004. I would do little jokes here and there, but the kids were young (2-10) and it was mostly just a fun surprise for dinner. As the years went on, I started doing other fun things here and there, including in their lunches. It's been 11 years and I'm starting to have to repeat old tricks. The kids are older now and the surprise has turned to seeing what they might be. My high school son has friends who have seen his lunches since middle school, and they gather near him to see what silliness this year's lunch will contain. I had a list of shenanigans and tomfoolery I was planning and started executing them the night before. There are always some I have to cut, but after all, April 1 will come again next year. I made a to-do list dividing everything according to deadlines, and then got to work. I covered each of their bedroom doors with caution tape. I stuffed newspaper into the toes of their shoes. Last summer, I procured a collection of signs from a clearance table at a hardware store. I posted one on the back door and one on the bathroom. Next, I got to work on lunch. Sandwiches were pb&j. I bought small, plastic frogs that I cut in half and placed in the sandwiches. I did a chip switch I've used before and filled the bags with a different kind of chip. I had to carefully (and partially) open the bags. After shaking out the chips, I replaced them with different chips. With a little white glue I closed them with paper clips to hold closed until they dried. Dessert was a small bag of candy that looked like peas & carrots. Everything was decorated with a pair of googly-eyes, including the tangelo. To finish, I wrapped everything separately in Elmo wrapping paper. Once everyone left for the day, I started on the rest of the list. I put electric tape over the remote and my son's computer mouse. He checked it before he even used it, and he told me later, he hid the power cord in case I planned to mess with the computer. Later in the day, it took a couple of minutes for my oldest son to remember what was going on with the remote. Next I copied a trick Jim often played on Dwight from the TV show "The Office". My youngest is a fan and so the night before I made the first layer in a bowl of Jell-o. In the morning, I was able to put my son's pocket knife in the center and pour the second layer of Jell-o over it. For dinner this year, my youngest requested the meatloaf & mashed potato cake I've made a couple of times. It's now become the dinner tradition. Along with that I planned to serve mini-watermelons, crescent roll carrots and some (regular) cranberry sauce. 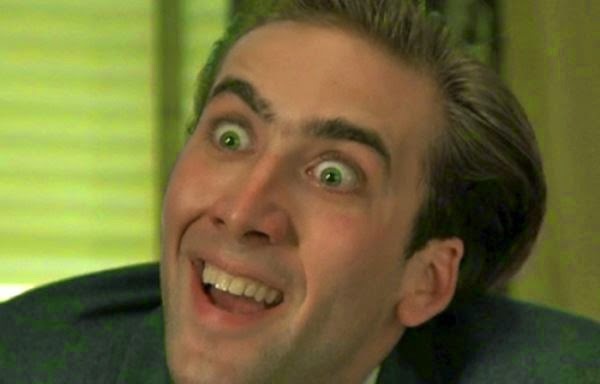 All of my kids think the Nicolas Cage memes are funny. I had a bunch of photos printed at Costco and then put them around their rooms. Later, I knew my daughter was attending a hockey game, so I went to her house to "decorate" her room. It included a lot of googly eyes, a rubber snake, a plastic spider and quite a few Nicolas Cage photos. The best part for me was that she left her laptop open. I changed her facebook profile and cover photos...she still hasn't noticed. It was a very fun day. What made me even happier was hearing about the pranks my kids pulled. My adult daughter and her co-worker friend had the closing shift did a few before leaving. They wrote stacks of notes that they put on top of all the ceiling fans. They set all the timers to go off at the same time. They filled plastic cups of water all over the manager's office and some with fruit punch. With the colored cups they spelled out "April FoolZ". My middle schooler put those "exploding" party snaps under the toilet seat at home. My high schooler had a few up his sleeve. The night before he made a whole post-it-note pad that he taped the troll face to. He also sacrificed a dollar bill taped troll face to the ripped off corners. He hid them and even pranked two of his teachers. They both laughed. He got to see the whole thing play out with his favorite teacher who has a great sense of humor. It included the light in his eyes when he discovered the corner of a dollar under papers on his desk, and the "crushing blow of despair" when he realized he was foiled. We all had a fun day. I can already start my to-do list for next year with the things I had to scratch. Click here for all of the photos with links to the recipes & instructions. How about you? Did you have any fun?